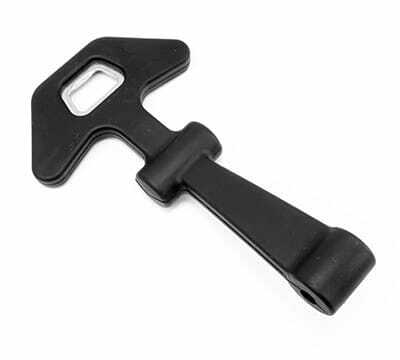 Transfer molding is an ideal process to not only produce precision molded rubber products like latches, but also products that require rubber bonded to metal surfaces. Rubber Transfer Molding combines the advantages of injection molding with the ease of compression molding. Rubber transfer molding is the ideal process for forming parts that require exact positioning like latches. The process of transfer molding involves pushing unvulcanized rubber through sprues into a heated mold. Similar to compression molding, transfer molding requires raw material preparation into pellets and/or pre-forms. Rather than placing the preform in the mold cavity, the rubber pre-form is placed in a chamber “pot” at the top of the mold then placed in a press. In the pot, the material is compressed by a heated plunger and transferred through sprues into the cavity below. The plunger is kept in place until the preform takes on the shape of the mold and the rubber is vulcanized. The part cures, hardens, cools, then is ejected. Excess cured rubber left in the pot, is removed, mold cavities are cleaned and the next molding cycle begins.